There aren't too many people living who remember this now, but Rincon Hill was once the fanciest neighborhood in San Francisco. You know the place, right? It's south of Market Street, an asphalt-covered lump of rock with the Bay Bridge sticking out of the north-east side and Second Street running by, out to the Giants' ballpark. That's Rincon Hill. What's left of it, anyway. 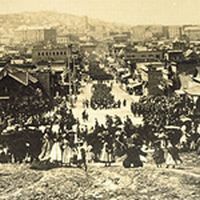 As San Francisco's Gold Rush-era population explosion of tents and rickety clapboard started to settle down, the bank accounts of merchants and lucky miners started to fill up. Men were becoming civilized, acquiring culture, and the sort of women known as "wives" were moving into town. This led to a demand for a neighborhood that was distinctly separate from the barbarous Barbary Coast, and with its sunny weather, gentle elevation, and spectacular views of the Bay, Rincon Hill filled the bill. According to the Annals of San Francisco, by 1853 Rincon Hill was dotted with "numerous elegant structures" -- including the little gated community of South Park. By the 1860s, the Hill was covered with mansions in a riot of architectural styles, and had become the social epicenter of the young city. And then in 1968 1867 (cue evil-real-estate-developer music here) a San Franciscan named John Middleton got himself elected to the California State Legislature. According to some sources, his elevation was part of a conspiracy to push through a specific radical civic "improvement".